A showcase cake that's fun and chocolaty. The colours are unforgettable. This was my first time making a Red Velvet cake, but it turned out unbelievable. On top of it being just simply delicious it's also impressive on the eyes. You won't be disappointed. It's essentially a Sweet Cherry Mascarpone Cheesecake tag teamed with the richest chocolate cake ever. This recipe has the distinction of coming from the South. Preheat oven to 350. Prepare two 9 inch pans with removable bottoms. Trace parchment paper with cake pan's bottom to line the bottoms. You'll need to make 3 total - one for each layer. Sift together flours, cocoa, baking powder, baking soda, and salt. Set aside. In a large bowl, whisk together sugar, oil, buttermilk, eggs, vinegar and vanilla until combined. 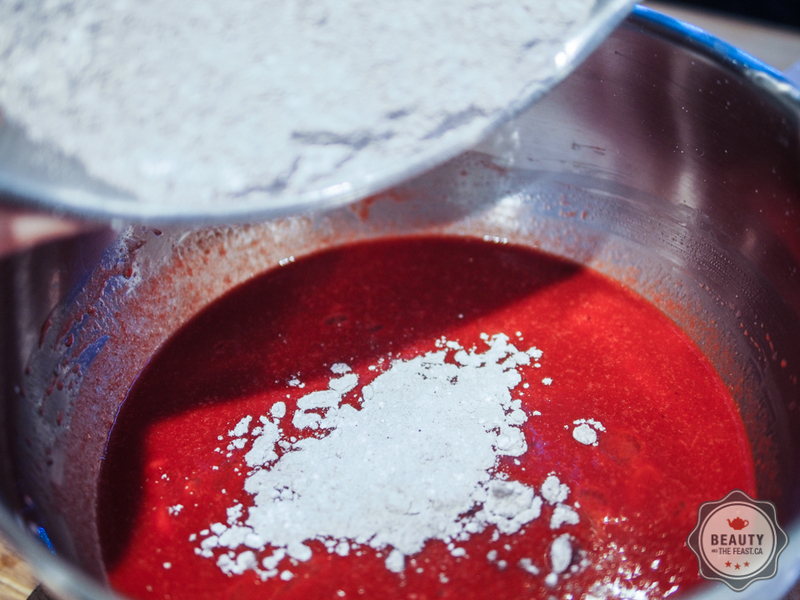 Add Red Velvet emulsion and whisk carefully until just combined. The red dye gets EVERYWHERE! Sprinkle dry ingredients over wet in thirds. Mix until just combined. Remove from pan as soon as it's cool enough to the touch as you'll need the pan to bake the dark layer. Place the reserved parchment circle into the pan and set aside. Add eggs, coffee, buttermilk, oil and vanilla. Beat for 2 minutes on medium speed. Batter will be thin. Pour into prepared pan. Bake at 350 degrees F for 30 to 40 minutes, or until toothpick inserted into center of cake comes out clean. See Sweet Cherry Vanilla Bean Pie Recipe. Make just the filling. Make sure all ingredients are at room temperature. You can even cut up the cheeses and butter into cubes in advance and let them come to room temperature. This will help, but not eliminate lumps. Notes: Combine the cake as you wish, but from bottom up I did Red Velvet, Cherry Filling with the mascarpone piped edges, Chocolate Sin, Cherry Filling with the mascarpone piped edges, Red Velvet, then iced it completely with mascarpone icing. To make crispy crumble for the cake, take the remainder of the cake tops from leveling the cake and crumble in a bowl with a fork. Bake in the oven at 350 until crunchy ~ 15 mins. mix with cocoa nibs for an interesting crunch and interesting visual texture. Vahlrona Chocolate with cocoa nibs and black cocoa.